Informational Meetings to take place on Sept. 26 & 27 in Pine Ridge and Kyle (South Dakota)The precious drinking water supply of the Oglala Lakota people will be overlapped more than a few times if TransCanada gets its way and the US State Department approves its second attempt to get a permit to build the Keystone XL pipeline. The pipeline will enter this big land in Montana, come south and skirt the Cheyenne River, Pine Ridge, Lower Brule, and Rosebud Reservations before it enters Nebraska. Recently, TransCanada revealed its “new” route through the sandhills of Nebraska, keeping their budget in mind, they diverted a total of 20 miles. There is sandhills land on the Pine Ridge in the LaCreek District. The KXL pipeline will be buried into the Ogllala Aquifer, in numerous places when one digs a few feet down, water rises. Our Lakota people, and people all over South Dakota, depend on the Rural Water Pipeline, or Lyman Jones as it is called off-reservation. It crosses the Lyman Jones in 43 places. It crosses our water pipeline to the Pine Ridge at least twice. The KXL will carry dirty crude tarsands oil from the mines near the Ft McMurray area of Alberta, Canada. Much of the pristine Boreal Forest has been totally decimated, strip mined to bare dirt, to get at the tarsands oil deep in Mother Earth. The oil miners use 3 to 4 barrels of drinking water to produce one barrel of oil, and stores billions of gallons of waste water in huge waste water ponds. It is a secret what chemicals they use to dilute the heavy crude! However, a VietNam Veteran knew that some of the chemicals are the same as what was used in Agent Orange, revealed in a meeting with the US State Dept I attended last spring in Washington, DC. That VietNam Veteran is from here on the Pine Ridge. Maybe he will come and speak out! Owe Aku is hosting a series of “Sacred Water Protection Teach Ins” across Lakota Territory, the first will be held at our own famous Billy Mills Hall in Pine Ridge Village on September 26, 2012 and at Kyle on September 27, 2012 at the Church Hall, both begin at 1pm. On both dates, there will be guest speakers and a lot of handouts to share FACTS on the tarsands oil mine, the KXL oil pipeline, and the historical and cultural Lakota land sites that TransCanada plans to cross. Tribal officials will be speak on these significant landsites, allied organizations who also work to protect drinking water and Mother Earth will be speaking, and we will have slideshows to share images from the tarsands oil mine and other water destruction mining and mining-related activities. We will have handouts that describe how each Tribal Government plans to protect their Homelands, and we want to generate a discussion on how we can all work together to protect our sacred water, Mother Earth, and coming generations. We will share images of how people in Texas are protecting their ranches, farms and neighborhoods from TransCanada’s KXL oil pipeline, and from heavy haul trucks carrying equipment across our Homelands, as well the river hauls in BC Canada. 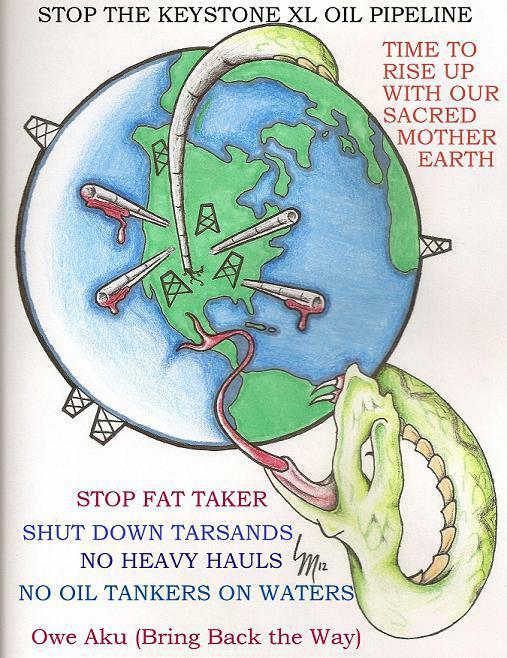 Info will be available regarding the impacts of oil mining using the hydrofracturing (fracking) method, a technique that is being banned around the world, yet is being practiced all over this big land. There is recent discussion on the Pine Ridge regarding fracking near our northern border and on the Reservation as well. Several tribal candidates are already discussing how the Oglala Sioux Tribe must prepare for oil ‘fracking’. We want to give folks an opportunity to voice their opinion on this crucial topic. An update on the uranium case against Cameco, Inc. In Situ Leach uranium mine in Crawford Nebraska, as well Cameco’s plans for three new uranium mines will be discussed. There will be time for Traditional Headsmen to speak regarding these mining issues and to lead the discussion on a statement from all those in attendance regarding the protection of our sacred water, Mother Earth and coming generations, after all, we protect this sacred water for them, it is their water. Mni wicozani, through water there is life. Oglala musicians Scatter Their Own will share their awesome indigenous music, and a drum group will share their songs. A feed will follow, and there will be beverages and snacks all afternoon. The “Sacred Water Protection Teach In” is open to all people, everyone is encouraged to attend, learn what you can, share what you know, be part of the statement made on these dates! Bring your friends, relatives and neighbors. For more info call Vic Camp at 605-407-7808 and Alex White Plume at 605-455-2155, or look up the “Sacred Water Protection Teach In” event page on Facebook.